Metro is poised to approve a $42 million expansion of Metro Bike Share in 2017. Photo: Joe Linton/Streetsblog L.A.
On Wednesday, the Metro Planning and Programming Committee approved funding to expand Metro Bike Share in 2017. 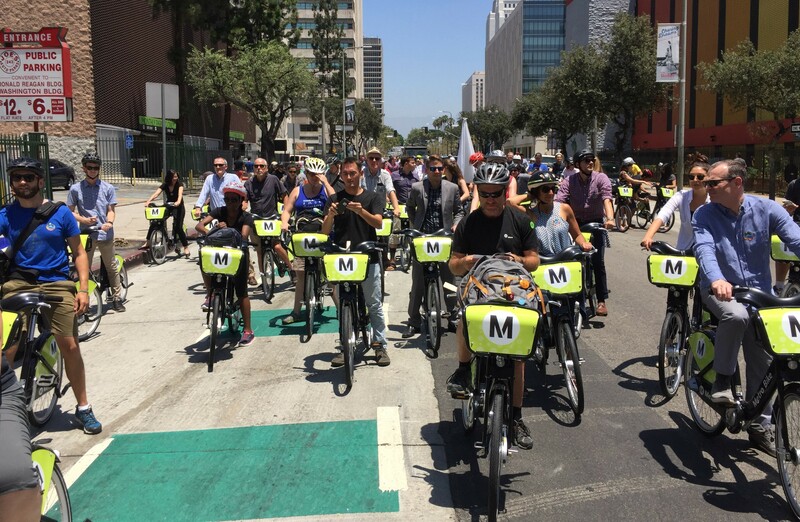 Operated by Bicycle Transit Systems, Metro Bike Share opened in downtown L.A. in July. In 2017, Metro would expand bike-share to new service areas in Pasadena, Venice, San Pedro, and Wilmington. If the bike-share expansion plan is approved by the Board next week, Metro will allocate $42 million to continue and to expand bicycling in L.A. County. Any expansion of bike-share is welcome. Unfortunately, some of the new locations raise questions as to whether expansion plans are more political than strategic, and more focused on tourists than on local riders. Plans to launch bike-share systems in separate geographical areas or nodes are almost certainly a recipe for low usage. Small bike-share systems are generally low performers. Breaking a finite amount of bike share resources into smaller pieces needlessly sacrifices the utility and productivity of stations/bicycles. Watch Orcutt’s explainer video for a good visualization of these points. A NACTO report found lower-performing bike-share systems in cities with more spread-out systems. Many cities bow to political pressure to spread stations over a wide geographic area in order to accommodate various constituencies. Metro is poised to make this common mistake. Metro’s initial bike-share pilot was planned for downtown L.A. then Pasadena. After Pasadena, the plans were more tentative, with possible expansion in numerous areas pending further study. Locations designated for further study included Koreatown, MacArthur Park, Echo Park, Hollywood, West Hollywood, Venice, Marina Del Rey, North Hollywood, Huntington Park, and East Los Angeles. The Port area did not make the initial study list. Expansion is not entirely up to Metro. Metro’s policy mandates cost share arrangements with local jurisdictions, so, to a large extent, expansion follows funding. This is especially true for planned expansion to the Port of Los Angeles locations in San Pedro and Wilmington. According to testimony from Metro Deputy Executive Officer for Active Transportation Laura Cornejo, the Port system would primarily cater to tourists. Metro staff reported that other bike-share systems driven by tourist use are “quite profitable.” Cornejo stated that the Port was interested in implementing bike-share and was considering a “neighboring provider.” The provider went unnamed, but clearly it has to be CycleHop, which runs Long Beach Bike Share. The Port comes to the table with money. Up front, the Port and Metro would each pay $334,000 in initial capital costs for 120 bikes at 11 stations, tentatively seven in San Pedro and four in Wilmington. Subsequent ongoing operation costs are split with the Port paying 65 percent. Metro approved a conservative scenario for its share of the Port system capital costs plus six years operations for a grand total of $4.9 million. These Port systems – with four and seven stations, and very little in the way of transit connections – could see very little usage. Bike-share systems in the Orange County cities of Fullerton and Anaheim failed with eleven and three stations, respectively. Cornejo characterized the Port of L.A. system as an “interesting pilot.” Time will tell if it turns out to be nearly $5 million in limited Metro bike-share funding well spent. The Pasadena and Venice systems are more fully-featured and more likely to be successful. The city of Pasadena was always second in line in Metro’s regional bike-share plan. The Pasadena system will be roughly half the size of the current downtown Los Angeles one; there will be 34 docking stations and 375 bicycles. Pasadena’s system will have excellent connectivity with five Metro Gold Line rail stations: Fillmore, Del Mar, Memorial Park, Lake, and Allen. Pasadena received Metro Call for Projects funding for the city’s share of the initial costs. Metro and Pasadena split the initial $2 million capital cost. Then Metro’s commitment, again in a conservative minimal-revenue scenario would be $11 million for six years. According to Cornejo, Venice was selected to proceed quickly due to the interest and support from Los Angeles City Councilmember and Metro Boardmember Mike Bonin. CycleHop is merging and integrating its bike-share systems in Santa Monica, Long Beach, Beverly Hills, West Hollywood and, soon, UCLA. This westside regional system could easily spread along the “quite profitable” coastal tourist market extending from Santa Monica into South Bay beach cities. Except that the city of L.A.’s Venice neighborhood stands between Santa Monica and the South Bay. The decision, by the city of L.A. and Metro, to select Venice for early expansion could be motivated by wanting to get in on the tourist market ahead of the competition. Metro’s Venice bike-share system will have 15 stations and an unspecified number of bicycles, likely 150-200+. Metro’s share of Venice bike-share capital plus six-year operating costs come to $5.1 million. Venice already has several Santa Monica Breeze bike-share stations operated by CycleHop. Under the agreement that allows Santa Monica to place five Breeze stations in Venice, Venice (part of the city of L.A.) can reciprocate with five stations in Santa Monica. These new Santa Monica Metro Bike Share stations could go far to enhance the Venice bike-share network by connecting it with the Metro Expo Line. On the other hand, those five new Santa Monica stations contribute little to mobility, as Santa Monica is already well served by bike-share. Having these two systems go head-to-head this early on seems potentially poised to start a sort of territorial cold war. Instead of a détente where CycleHop runs a network of Westside smart-bike systems and Metro’s contractor Bicycle Transit Systems runs a network of central L.A. County smart-dock systems, it looks like the Venice/Santa Monica market will get a glut of investment, potentially resulting in some simmering conflict and rider confusion. In a best-case scenario, there will be peaceful coexistence, perhaps even synergy. The proximity of the two systems could foster a respectful healthy competition with both vendors striving to better serve bike-share customers. This could precipitate full-fledged system inter-operability, with features like joint-membership so any rider could easily ride either Metro or Breeze bikes. In a worst-case scenario, there could be bitter conflicts. It took quite a bit of permitting bureaucracy to allow the first Breeze stations in Venice, so perhaps L.A. could take issue with Santa Monica over Metro Bike Share station permitting or placement there. Conflicts could lead to the revoking of agreements, the removal of stations, stricter system boundaries, retaliation, bullying, and diminished overall utility for mobility. This apparent competition for the profitable coastal markets has implications for mobility and equity. Funding available for bike-share is limited. If both CycleHop and Metro/Bicycle Transit Systems end up focusing much of their resources in the same Venice/Santa Monica area already served by bike-share, then resources are not available for other parts of the county that lack bike-share. Like too much of the “sharing economy,” if both systems chase tourist markets, then expansion into low-income neighborhoods will never happen. County Supervisor Hilda Solis asked Metro staff about this dynamic this week questioning when Metro Bike Share will reach areas that “aren’t along the beach.” Solis represents unincorporated East Los Angeles, which was recently awarded Call for Projects funding to implement Metro Bike Share, which will include connections with Metro Gold Line stations. Metro’s early approach to bike-share was praised by the L.A. Times, and The Tranport Politic for being “a new type of bike sharing… tightly integrated into the transit system.” The Pasadena expansion builds on the strength of bike-share serving transit’s first/last mile. The Port of L.A. system hardly does at all. The Venice system only does in a place where that service already exists. What would Metro Bike Share expansion look like if the agency most highly prioritized transit connections, mobility and equity? One scenario would be to expand the downtown L.A. service area along the Blue, Gold, Expo, Red, and/or Purple lines. Expanded bike-share in MacArthur Park, Lincoln Heights, Boyle Heights, and South L.A. would complement Metro’s earlier investments in rail and bike-share systems. Prioritizing investments in these first/last mile zones would serve Metro’s transit riders. Overall it is good news that Metro Bike Share is investing in expansion only three months after its downtown L.A. premiere. Nationwide, bike-share is still in its infancy. Senior U.S. bike-share systems are around a decade old. L.A. County’s first bike share, Breeze, turns one year old next month. All in all, bike-share remains fairly fluid. In this dynamic environment, it does not make sense for Metro to place all its eggs in one basket, whether that basket is downtown L.A., tourists, or even disadvantaged communities. It is not clear exactly how L.A. County bike-share systems will function best. Nonetheless, it is important to make sure that expansion is as balanced, efficient, fair, and equitable as possible. My own anecdotal evidence from riding past Bikeshare stations in WeHo and Santa Monica daily? WeHo forgot to give the novice riders (bikeshare customers) anywhere to ride. Thus full bikeshare racks every day. Doomed to failure. I saw two folks last week on WeHo bike shares riding ON THE SIDEWALK and even then they looked terrified. Santa Monica stations are generally 3/4 to 1/2 full which means Santa Monica gave it’s novice riders a place to ride. I will keep saying this until someone listens, WeHo is gnarly for even experienced riders. I have been riding through it every day for many years now and it’s always a gauntlet. Their bikeshare is doomed to failure unless they begin rethinking how they implement bike lanes and how they can solve the horror that is rush hour on Santa Monica Blvd. I do not relax until I reach the city limits of Santa Monica. Then it’s all smiles and waves as dozens of cyclists pedal happily by. Honestly, I am excited to see bikeshare stations popping up because I want more people to ride but I honestly do not understand how they expect folks with no training or experience to navigate LA’s not-so-friendly streets? WeHo shows it’s ignorance by putting bikeshares where normal folks would never, ever ride. Santa Monica Blvd. I say this as someone who rides SM Blvd five days a week but I’m a crazy vehicular cyclist. We’ll end up with two incompatible BikeShare systems in Venice, and none in places that would embrace it like El Monte and Pomona. I am certainly for building more good and great places to ride… but it can work in different directions: WeHo bike facilities could make bike-share work, or WeHo bike-share could provide an impetus for WeHo to make their streets safer. Bike-share systems work in places with lots of infrastructure (Minneapolis, NYC) and in places with very little (San Antonio.) And, I’ve said it before ( http://la.streetsblog.org/2014/02/04/lessons-from-nyc-key-to-bike-share-is-walkability/ ), but for bike-share don’t forget that right up there with bikeability is walkability. With docks, there’s still a few blocks to walk at the end of a bike-share trip… those blocks need to walked and walkable. Great analysis Joe! I agree on almost all of your points. I wish Metro would commit the majority (60-80 percent) of their resources to expanding the core system in a contiguous manner, e.g. from downtown towards Koreatown and USC. The remainder could then be distributed to other areas with high potential. Metro should cede the beach community markets to CycleHop to allow them to create their own contiguous network. If both networks continue to expand, only then would I suggest designing the systems to operate in direct competition. SM Blvd has broad sidewalks with great walking opportunities. That part of the equation is fine. Unless you’re advocating for folks to ride the green bikes on those (remember that woman who was right-hooked riding on the sidewalk in WeHo last week?) then my point and my pessimism still stands – the bikeshare in WeHo will never succeed until they improve the riding conditions on SM Blvd. As it stands now, I am seeing full bikeshare stations every day and I do not see that changing any time soon. If anyone has any info on how well their bikeshare is doing I would be interested to see that. It looks like Breeze is doing ok but I doubt even they are super excited about their usage rates. I do hope you’re right and I’m wrong though. In my opinion you cannot just plop down bikeshares along high speed stroads like SM Blvd and just hope that average people will hop on bikes (even if there are ‘bike lanes’ present). They are going to end up riding on the sidewalks which is obviously a HUGE NO-NO or more likely, just shrug and not bother. On a related note, it looks like WeHo has taken down many of it’s “No bikes On The Sidewalk” signs? I do know they force their bike patrols to ride on the sidewalks, which again, is not what you want to be doing. It also sends a confusing message when you make it illegal for citizens to ride on the sidewalk but force your security people to ride there. As someone who’s used both Santa Monica’s and Metro’s bikeshare systems (but more often the latter), I think it would be nice for Metro to consider switching to Santa Monica’s Cyclehop model. While Cyclehop’s onboard computers could use some work, the fact that those bikes include a lock and allow their users to lock their bike outside of bikeshare stations (and either keep the reservation active or end it) adds quite of bit of flexibility that Metro’s current system lacks. As it stands now, if I’m using a Metro Bike Share bike and am about 2-3 blocks from the nearest dock, if I see a store or restaurant I want to patronize, I either have to ride 2-3 blocks to return the bike and then walk 2-3 blocks back, or I’m forced to walk the bike into the business establishment with me until I finish my business there. Inconvenient. Do the Metro Bike Share bikes not have integrated locks for temporary stops? Other B-Cycle bikes I’ve ridden all have locks built into them for using if you make a stop sometime in the middle of your ride. I recently visited Munich, Germany where on the real crowded streets they allow bikes on specially designated bike lanes on the SideWalk which looked like a perfectly safe solution away from heavy automobile traffic. No, the only place you can lock these bikes is at the 61 hubs. I’ve always considered this lack of flexibility, and the associated station density and limited number of destination choices, as the biggest reason to prefer the smart bike model. “Can’t afford protected bike lanes, no funding” says the agency spending $42 million+ on bike-share. Look, I’m all for bike-share in downtown areas, but the problem is not a shortage of bicycles, it’s a shortage of infrastructure. This so perfectly demonstrates the political nature of transportation funding. We have lots of money for bike-share but pit cities against each other when they compete for scraps to implement infrastructure. If a high quality protected bike lane costs $2 million (and that seems to be a bit high), we could have had Metro fund 21 miles of quality infrastructure connecting to Metro stations. Or, we could have had some halfway decent bike parking at dozens of Metro stations where people don’t need to worry about theft. Bike-share is the new sharrow: a feel-good measure that doesn’t challenge the status quo. This temps me to vote no on Measure M. Metro has money for unnecessary pedestrian bridges, for massive parking lots, and bike-share..but no, hardly a penny for infrastructure. I’ve taken a closer look at the supporting documents and I’m even more convinced that Metro is making a mistake with this bike expansion plan. They should tell the planning staff that they appreciate the effort but they want a plan that enhances the likelihood of success for the system. 3) New markets: expanding to outlying areas (such as Pasadena or the beach cities) that have the potential to survive and expand on their own. The expansion plan that I envision would increase the likelihood of success and sustainability for the system. This will also allow Metro to highlight their successful system and use it as a vehicle for encouraging further investment in bike and bike-share infrastructure. The expansion plan under consideration by Metro gets these priorities backwards, and increases the likelihood that isolated elements of the system will fail and perpetuate the myth that bikes aren’t a viable mode of transportation in LA. Spot on. With this planned expansion, that bring’s Metro’s bike share total to $53mn. They could’ve built a LOT of infrastructure with that amount of money, both bikeways themselves and decent bike parking at the transit stations. Both are critically lacking in LA County and would be far better uses of the money than expanding the bike share system. Joe: Where does Metro say they “Can’t afford protected bike lanes, no funding”? Really, please show me. Metro doesn’t own the streets, the cities own the streets. I agree that we need both infrastructure and Bike Share. Metro should leverage their funding sources to encourage cities to build bike infrastructure. Quid pro quo: you build the protected bike lanes, we’ll give you Bike Share. So with this announcement, that brings Metro’s bike share commitment thus far to $53mn. That’s no small pittance and even though it’s being spread over several years and LA County is quite populated, that still a lot of money going to bike share that given the reality of conditions on the ground, might be better spent elsewhere (recall that Portland reports that their initial bikeway network only cost $60mn, a mere $7mn more than Metro’s bike share expenditures). There’s still a chronic dearth of decent bike parking at major transit stations and accessing most of those same stations by bike is laughably inadequate. That $53mn would build a lot of the infrastructure for either/both goals that almost certainly would provide a far better improvement in biking conditions to the existing riders as well as attract new ones as compared to a bike share expansion. If this funding ultimately is a small part (perhaps 5% or less) of what Metro is committing to spending on biking over the life of the commitment, then it’s excusable. But if it represents a significant part of Metro’s bike investment during that time, then this is really giving the current bicyclists of LA County a giant middle finger, especially those who can’t even afford to use the system. I may be biased, but I think San Pedro has potential. Ports O’ Call gets really crowded on the weekends, and so does Cabrillo Beach.